Today was a pretty good day I must say. I woke up before the alarm, got dressed and hit the gym. I even got there earlier than usual which is great! I had plenty of time to do my weight training, ab circuit and cardio. I am determined this week to get everything in. It’s my birthday week. One of my presents to myself will be going hard at the gym and sticking to my meal plans faithfully. I also want to buy myself a pull-up bar to attach to the bedroom door. I’m going to be practicing everyday. I really want to be able to do pull-ups without any help! I think this is the epitome of physical strength in a woman. If you can do a pull-up, unassisted, you are strong. My third gift will be an ice cream maker. (I’m tired of making protein ice cream by shaking up the bag. It takes too long). I will be 31 on Saturday. 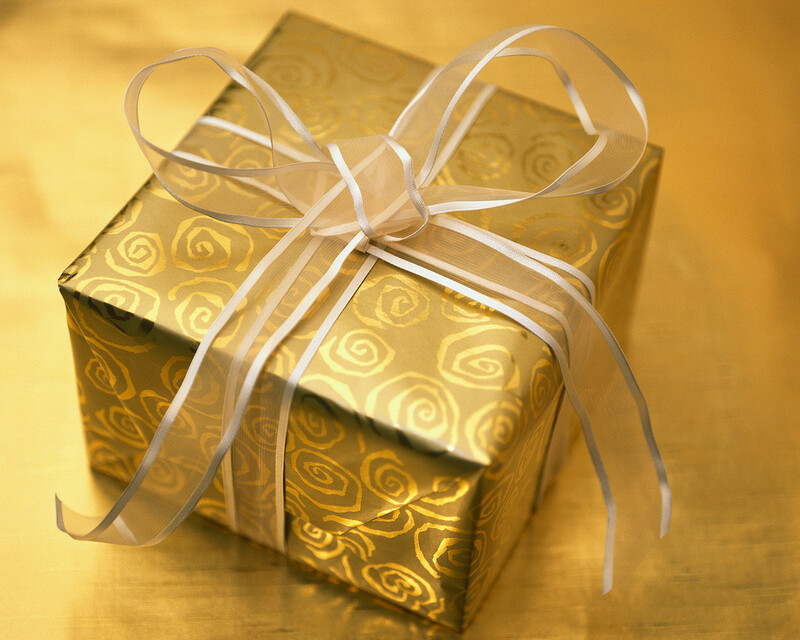 Anytime your birthday rolls around you always do a self-examination to see where you are at in your life. I think I’m doing pretty good. I am definitely more aware than I was at 21. I am more free, more confident, more goal-driven and more determined to do what I want to do. That is what this year is all about…doing what I desire to do. I’m sure 31 will be a fabulous year! Today is “Super Soul Sunday” on the OWN channel. I have literally been sitting on the couch all day watching various inspirational shows on Oprah. I did my regular Sunday workout and picked up a few fruits and vegetables from Wal-Mart. The after hours door at the gym I usually go to has not been working for the past two days so I ended up having to drive to another location. Side note*: This is a little irritating when you already have to fight to drag yourself to the gym. Anywhoo, I drove to the other gym, made a few alterations in my routine and had an excellent workout. (Maybe it was because I was mad about having to drive to a different location and I took it out on the weights and the treadmill!). Back to Oprah. I felt like I had an entire day full of inspiration. The first show that came on discussed a guy on a quest to understand why he was able to sense and see things that most people could not. He never told anyone until he met his girlfriend. She was of course skeptical but tried to understand. The man in the show visited many different places of worship. He visited a Christian church, a monastery, a psychic, a new age center, the home of a Native American family and I can’t remember the other places. In his journey, he decided that we all are basically the same and have the same desires and needs….he decided that he was happy with himself. The other shows that came on were Oprah’s master class shows which is basically a series that teaches different life lessons. On one show, Jim Carey talked about how he envisioned himself to be successful. He decided what he was going to do and always kept that at the forefront of his actions. He didn’t just wish it would happen, he acted in ways that would make it happen. On a separate show, Oprah talked about the time when Ellen DeGeneres visited her show and revealed she was a lesbian. The premise of this show was learning how to be your authentic self. A quote that I will never forget is, “If you are hiding something, you will never become all that you were meant to be.” Very applicable to any situation. Last week was a very rough week at work and by the end of the week I just felt exhausted and discouraged. My workouts seemed extra hard, I felt tired everyday, and I felt frustrated with other people’s actions at work. It just seems like as I get more into my training, nutrition, and goals, the more negative things happen in other areas. Today was a regenerative day, not physically but mentally. I needed this Super Soul Sunday. This journey is so much more mental than it is physical. 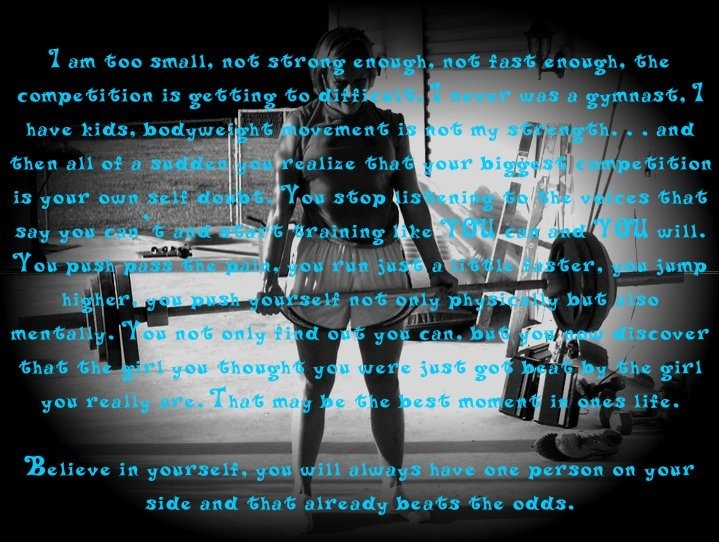 I can do all the training I want but if I don’t believe I can do it, then it won’t happen. I have to learn how to control my emotions, sacrifice a little bit (maybe a lot) and keep going in spite of what happens around me. There was a reason I decided to watch the OWN channel today because I don’t make it a habit. During my television fest I also planned my workouts for the entire week. I normally write my workout the day before or always rush around to get it done. I forced myself to do it. Yes, it took a very long time but I was able to see everything at one time and get the plan more specific to my goals. I incorporated specific exercises to work on my weak areas and created detailed cardio plans. This will help me to ensure I do everything I need to in order to make PROGRESS. That is what we all want but sometimes we keep doing the same things haphazardly not seeing the errors we make. This helped me to look at the big picture and adjust accordingly. I also cooked a few meals during this time and read some nutrition and training articles. I don’t know what lies ahead of me this week. My days prove to be pretty unpredictable lately but I do know how to handle anything that comes my way. I can do it, and whatever your goal is, you can do it too. You just have to believe, work hard and persist despite what goes on in the world. Here are a few more low-fat, healthier food swaps for you! Now, I am not a vegetarian by all means but I do enjoy eating the “meatless” products every once in a while. I have found that many of the soy-based veggie burgers are very high in sodium and have very little protein. In other words, they don’t benefit you much at all. I found a really great option for veggie burgers at Kroger. Franklin Farms makes the healthiest veggie burger I have seen. It is a portobello burger and has 14 grams of protein, 390 mg of sodium (some are much higher than that), 1.5 grams of fat, and 10 grams of carbs. Compare this to the Garden Burger brand that has 3.5 grams of fat, 10 more calories, 480 mg of sodium and only 6 grams of protein. See the difference? The little things do add up! I used to drink soda all of the time. When I was in college, my drink of choice was Dr. Pepper. Pretty soon, I won’t be drinking any carbonated beverages but right now, I can get away with a few. Although Diet Dr. Pepper does taste exactly like the real thing, (how do they do that?) it is still bad for you. 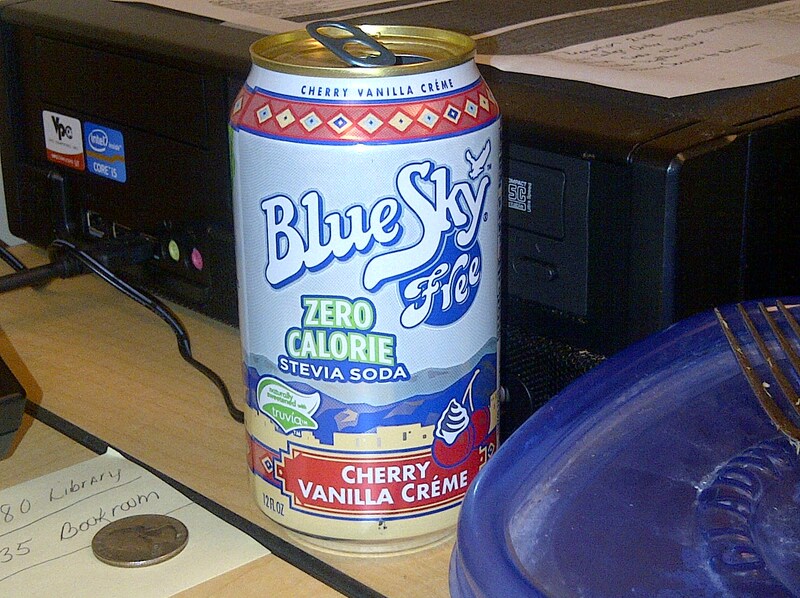 I was so happy when I found a natural “soda” by Blue Sky. The Vanilla and Cherry Creme flavor is the bomb!! I mean, maybe it is because I know I can’t drink regular soda and that is why it tastes so good but I can’t believe it. Of course it is zero fat, sugar, calories etc… It is sweetened with Stevia. Try this! I think you will like it. If you just need that strong taste and have to have the soda, this might satisfy you. I purchased this from Kroger as well. (It is on sale this week). Just go into the natural food section. It comes in a 6 pack. I love ice cream just like everyone else. 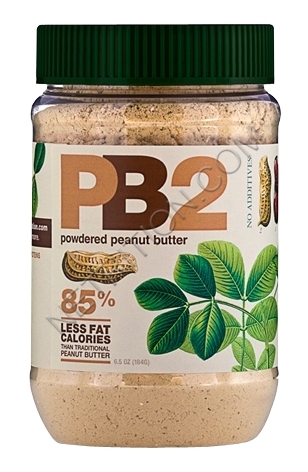 Although lately, I have been making my own protein ice cream, I have found alternatives to the higher fat versions. 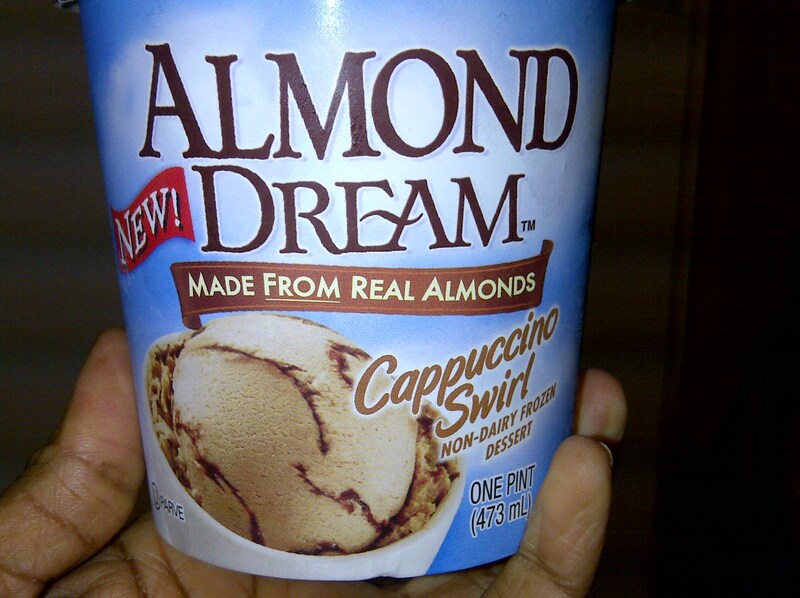 Almond Dream makes good ice cream and it is not dairy. So if you have an intolerance for dairy, this is a good option. You can also try the So Delicious brand. Depending on your goal, choose the no-sugar added kind or low-fat kind. There are many different versions, so read the labels carefully. Ice cream is okay every once in a while but why not make it a healthy ice cream? This morning was one of those mornings I did not want to get out of bed. I mean, I really had to talk myself up to get out of bed. I have to tell myself sometimes what my goal is…and trust me it is not easy. Of course, I am going to stick to my goal and I am pushing, and clawing, and doing everything to make it happen, because I know I can do it without a doubt. But, I have to make a choice EVERY DAY and every minute to stay committed. When you decide to do a competition, you don’t have people whispering in your ear telling you what to every moment but you always have your own voice to listen to. So, this week has been kind of busy and I am forcing myself now to write this blog before bed because this is also part of my goal. I have been thinking lately about how to create new recipes and lower fat versions of meals. If you have heard of the book, “Eat This, Not That,” then you know the entire book is about better substitutions for some of your favorite junk foods. For example, the book will tell you what to get from Burger King, like a Jr. Whopper and side salad instead of a regular Whopper and fries. But this will take it to a different level. 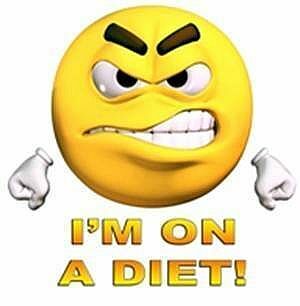 When you are trying to get extremely lean, you have to cut back on few things….lean body=lean diet. So, here are two substitutions I have been making lately. (They taste good too!) This will be an ongoing series so look for more! I have to cut back on the sugar so I don’t eat certain types of syrup. (Too much sugar turns into fat) I don’t eat the Aunt Jemima. 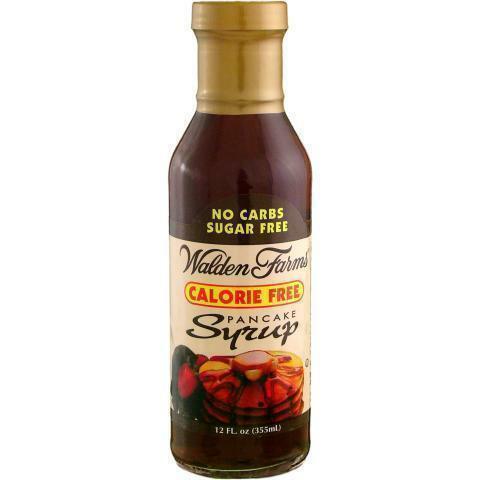 If I do eat syrup it has to be pure maple and only a tad bit…or if I want more, I will eat the Walden Farms Zero Calorie Syrup. I love the way it tastes. (Available on www.bodybuilding.com ). Also, I tried a new veggie this week! 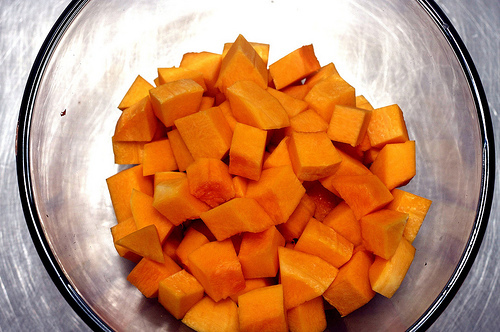 Butternut squash. This squash is sweet and tastes great. I put some sugar-free syrup and cinnamon on it and it was like a dessert. I think I will also try them mashed. Only 4o calories in a one-cup chopped serving. It fills you up nicely. You could probably bake them and eat them like fries too! This weekend just flew by. Saturday morning, I went to a free cross fit class with my friend. If you know anything about crossfit, it is one of the best functional training workouts you can get. All of the crossfit locations are in old-looking buildings, or old warehouses….I guess it goes along with the whole theme of getting down and dirty. It was pretty cool. Everyone was very friendly which helps because I always get nervous in new situations. Although I have done components of the workouts that they do, this was my first actual class. Though I had the jitters, I was feeling pretty confident about my abilities. We filled out our paperwork and waited around a few minutes for everyone to get there. Sit-ups (Legs straight out, arms overhead, straight out and touching toes when you sit all the way up). This sounds simple, right? Well, I will tell you that this is a workout. You start with 1, then you do 2, then you do 3 (of each exercise, back to back, fast). That is why it is called a pyramid…you keep climbing as high as you can in 11 minutes. I was focused and ready to go! They have this digital clock that you can watch as you are working out to keep track of your time. The coach started the music and I was off! Something about the music and the spirit from everyone else in the room just puts you in a zone. I loved it! The coaches were very motivating and kept us going. At the end, I was sweating. Each person reported on how many sets they did and they wrote your name on a white board with the number of sets and the amount of weight you used. I used an 18 lb kettlebell and got through 10 sets. Little did I know that the next day I would be sore. 🙂 My shoulders and upper back were so sore when I woke up the next morning! Who knew you could do so much work in 11 minutes. Those kettlebell swings are no joke if you don’t do them on a regular basis! Now that is the kind of workout I am talking about! I need to be sore so I know I am challenging my body in a different way. I plan to attend the foundations courses at crossfit and we will see from there. I think it is an excellent workout to supplement with your current routine. Because we got home so late last night….more like this morning, I was not able to do my Sunday Prep. So, what I did this morning was grab a few of my homemade muffins, some leftover salmon and black bean patties, an apple, and some nuts for my meals. I made a shake and some oatmeal for breakfast. Of course I did not workout this morning because I do require a little bit of sleep! Lol! I used today as my second rest day and will workout for the remainder of the week. A creative approach in my scheduling allowed me to do my weekly shopping. I work very close to my home so on my lunch break I went to Kroger and got my food for the week. They had some great deals! They had protein powder on “close-out.” I figured with as much protein powder as I use, this will come in handy. I have never really tried these brands but I did a thorough examination of the ingredients and figured I would give it a shot. They are vanilla and dreamsicle flavored. I usually stick to chocolate or banana but I can make some good recipes with these new flavors. 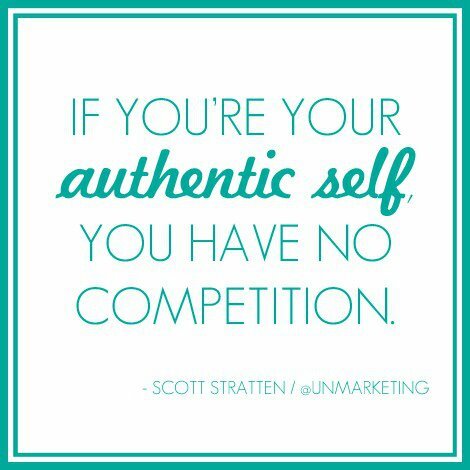 (I will tell you how it goes and which brands they are….it’s not the cheap stuff!). I am having sort of a vegan/vegetarian week. I did not have a lot of time to prep so my meals this week are quick and easy. Here are a few of them. Portobello Veggie Burgers ( I rarely do soy products for various reasons but this particular one has very low sodium and is made from mushrooms, egg whites, and soy, so you get more protein and not as much from soy. If you do your research, you’ll see why I don’t eat a whole lot of soy products but it is in everything so it is hard to avoid). Protein Powder ( Making protein pudding, shakes and ice cream). Here is to a wonderful and productive week! I have not posted in a while, frankly because I have been tired. I worked extra long hours earlier in the week and felt a little under the weather on Thursday. I ended up taking half of a sick day. I think I just needed to catch up on my rest so I did not work out today.This is flu season and I don’t want to take any chances and get sick. I know when my body is not feeling right and I PAY ATTENTION. Rephel and I got in the pool this evening (yes it was cold!). The point was to get in cold water to rejuvenate our muscles and then in the whirlpool to bring the nutrients back into our systems. So we sat in the pool for 10 minutes, got in the whirlpool for 10 minutes, and then back in the cold pool for another 10 minutes. Outside of being cold, I actually did feel better. Less sore. After all that excitement, I’m ready for a good night’s rest. 🙂 I am preparing for travel. I am going to one of my good friend’s wedding this weekend. 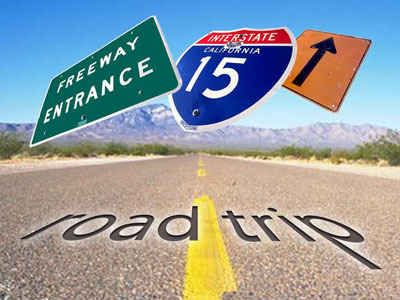 So because I will be traveling, I am getting my meal plan together for the road trip and time spent at someone else’s home. It is essential to prepare for situations like this because these are the times when you “fall off” your plan. When you don’t prepare or have a plan of attack, you fall off! Don’t let this happen to you! Traveling is no excuse to stuff yourself silly. Instead of taking a “wait and see” approach, pack your food just as you would everyday. Yes, everyone else will be eating big macs and pizza but just envision yourself with your ideal body while you’re eating your chicken and broccoli and sipping on your protein shake. Remember, this is an everyday thing! Sweet potato chips (I sliced the sweet potatoes very thin and baked them in the oven with the skin on. Easy and portable). Chicken wraps (Chopped up chicken breasts in 90 calorie Hungry Girl Whole Wheat Wraps with Flax Seed). I think I will put a little tomato paste on these for more flavor. Homemade blueberry protein muffins (I made these tonight…quick and portable). I am also going to take my Mp3 player and running shoes. I think I will go for a run the morning of the wedding. I need some sort of activity to get my day going. It gives me more energy. The last thing that I wanted to do today was my weekly meal prep. I was a little tired from the Zumba-thon on Saturday. (Two hours of non-stop Zumba!) It was a lot of fun. After the Zumba-thon, I went home for a couple of hours and we later headed to the football game. I was out all day on Saturday. This morning, I got up early and went to the gym and went grocery shopping afterwards. Wally world is one interesting place. I absolutely hate Wal-mart sometimes. I called myself being smart and beating the crowd but when I got there, just as many people were shopping as if I had waited to go later on in the day! Going to Wal-mart is like preparing to go to the battle field. You have to get your mind right to deal with some of those folks. Children crying, grocery carts in the middle of the aisle, cashiers who act like you are the last person they want to see on a Sunday morning, and you have to be ready to walk a mile to get to the door because the parking lot is so full. To prepare for the battle, I ate breakfast and drank a cup of coffee. I never go to the store hungry, especially after working out. If I do, I end up buying the whole store. One thing I do like about Wal-mart is the variety in the types of fresh food they have. I have a new project for myself; I create at least one new clean meal every Sunday. So I am constantly trying new foods. This will keep me from being bored and also allows me to educate myself on different foods. The Sunday meal for this week is braised beef stew. (I got the recipe from this month’s issue of Clean Eating Magazine). Perfect for the cooler weather we are having. Let m e say that this meal does take a long time to cook so if you make it, set aside 2-3 hours to be home. The prep time is only about 20 minutes but the stew has to cook for 2 hours on low heat. 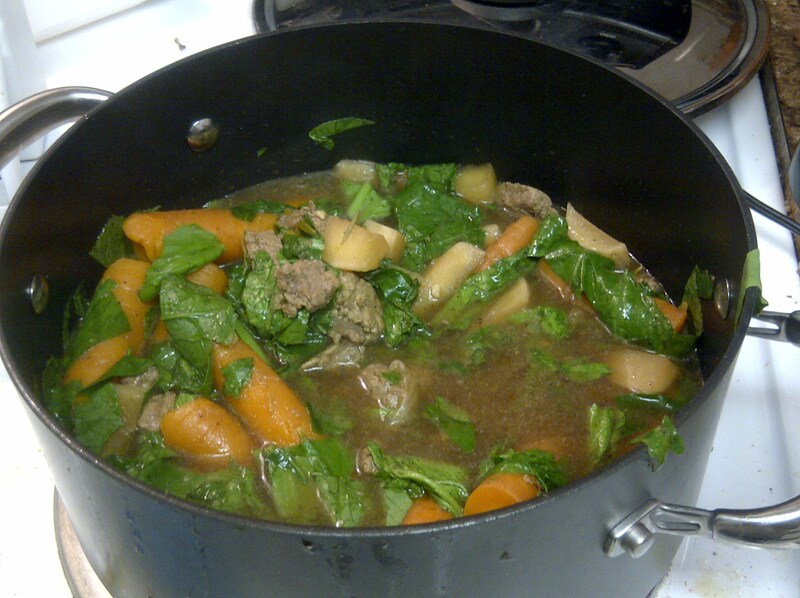 To make it you need, LEAN beef stew meat, carrots, turnips, turnip greens, garlic cloves, rosemary, LOW SODIUM beef broth, pepper, olive oil and sea salt. (recipe coming later….I’m pooped and have barely enough energy to write this post). 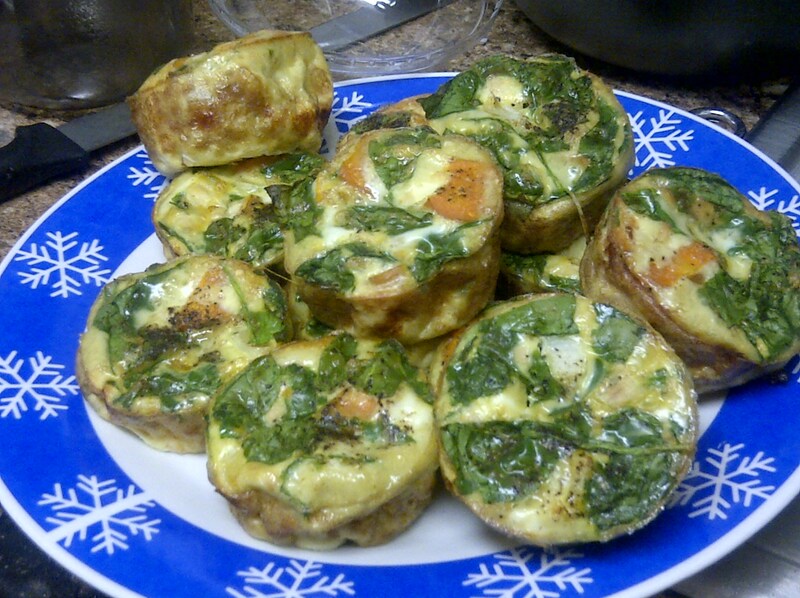 I also made egg muffins to eat for my breakfast this week. (This idea is taken from Oxygen Magazine.) I used 16 ounces of egg whites and four whole eggs. The veggies are optional and you can use any kind you want. You can also add in ground meat. First, I mixed the eggs together in a large bowl. I then chopped up a carrot, shredded some spinach and mixed them together with garlic cloves. 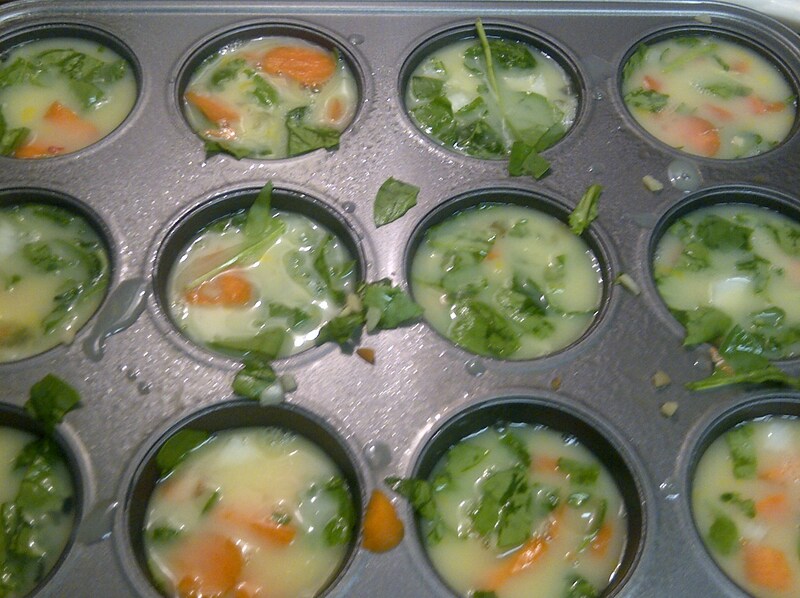 I took a 12 muffin tin and sprayed with olive oil while pre-heating the oven to 375 degrees. 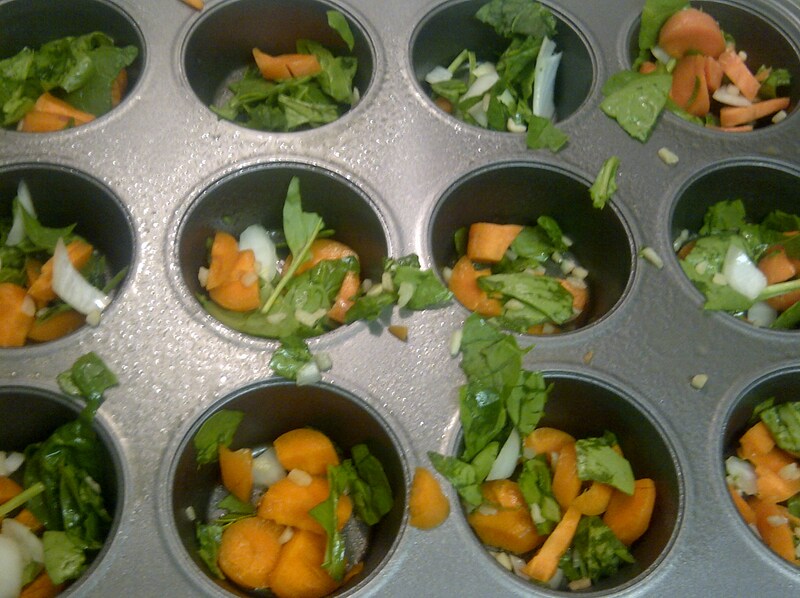 Step 1: Place veggies in muffin tins. Step 2: Add egg whites into the tins which should fill them up. Step 3: Bake for 30 minutes until the tops of the muffins are a little brown. You want to make sure they are done and not runny. T hese are portable and can be used for breakfast, snack or lunch. I have a pretty long day ahead of me tomorrow so I made sure to have my cooler ready so that I can grab it and go without wasting time. It’s only 8:00 but I will be winding down for bed in about an hour. In the morning I will hit the gym and head to work. I won’t have any time for prep of any sort. Off to prepare for my week!